The celebration continued as Navajo Republican Women gathered at the home of NCRWF member Ginny Wisely for our annual holiday celebration and installation of officers for the new year. Gifts were also presented to the Military Outreach Ministries for military children. After a very busy 2016, Sally Steele was installed for her second year as president as were all the other officers, with the exception of Glenda Boerner (Ways and Means) and Cathie Johns (Programs) who have completed two years of exceptional service. New first vice president Colleen White will take over Programs duties. Waskah Whelan was once again lauded for her extreme leadership as precinct and campaign chairman for the San Diego County Federated Women. Those who contributed so much of their time during the campaign were also thanked. Our first meeting of the new year will be Tuesday, Jan. 10, 2017, at La Mesa’s Brigantine Restaurant. Sgt. 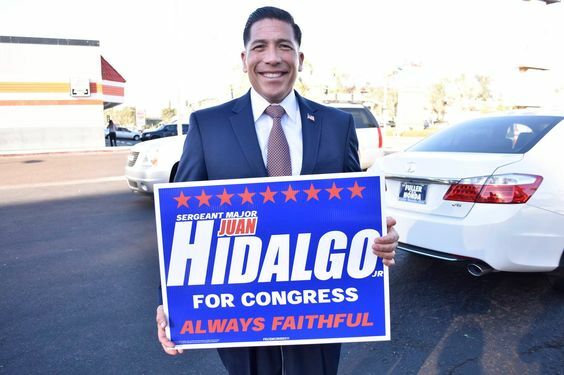 Maj. Juan Hidalgo, Jr., USMC (Ret) will give the keynote address called “Defending Freedom!” A well-decorated combat veteran, Hidalgo retired in October 2015 after more than 31 years of proven leadership and faithful service to our country. Recently, Hidalgo ran for California’s 51st Congressional District seat but lost to incumbent Juan Vargas. Check-in time for the 11 a.m. luncheon meeting is 10:30 a.m. A full-course luncheon will be served at noon with the speaker following at 12:30. To join us, RSVP to NCRWF99@gmail.com or call Marjie at 619-990-2791. Cost is $20 and reservations are required. Our membership drive for 2017 begins at the meeting. Dues are $35 for new members and we welcome all registered Republican women who would enjoy camaraderie with like-minded women. For more information on all our activities, visit us at navajocanyonrwf.org, and like us on Facebook. —Judy McCarty is publicity chair of the Navajo Canyon republican Women Federated. Reach her at jhmccarty@cox.net.